The transport served for a time with the Army Transport Service and was reacquired by the Navy 1 March 1950 for use by MSTS. Her early duties consisted mainly of carrying troops, dependents, and large numbers of European refugees. General Harry Taylor operated in a typical year to the Caribbean, Mediterranean, and to northern Europe. In 1957 the ship took part in the Hungarian Relief program, transporting several thousand refugees of the valiant but abortive Hungarian Revolution to Australia. She was placed in ready reserve 19 September 1957; transferred back to Maritime Administration 10 July 1958; and placed in the National Defense Reserve Fleet, Beaumont, Texas. General Harry Taylor was transferred to the Air Force 15 July 1961, and renamed General Hoyt S. Vandenberg (T-AGM-10). On 1 July 1964 she was acquired by the Navy and now is operated by MSTS in the Atlantic. 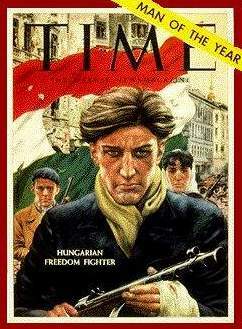 from "Dictionary of American Naval Fighting Ships"
1957: Time magazine names the "Hungarian Freedom Fighter"